Antarctica – Our 7th and final continent! 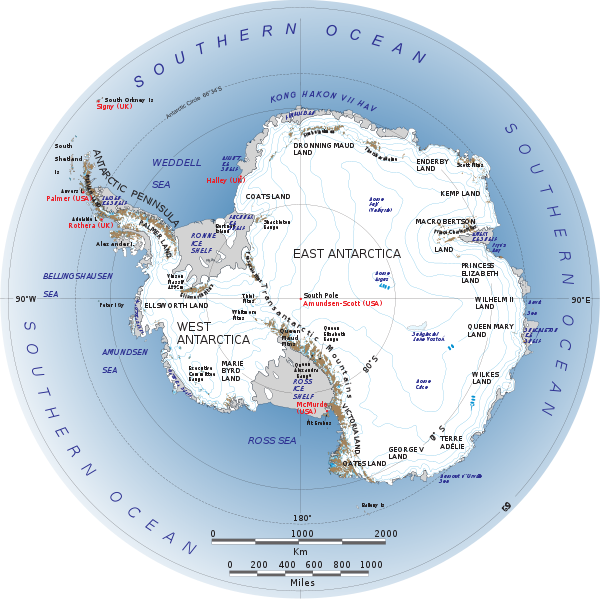 Antarctica is a huge area, we will be visiting the area at about the 10:00 position on the map below labeled “Antarctic Peninsula”. The total surface area is about 5.5 million sq miles in summer, which is approximately twice the size of Australia and half as big again as the USA. We are hoping this will also be our first sojourn into either of the “polar circles”, it just depends on how far south we can go on this trip. I thought I sent you 2 messages, must have done something wrong. All is well. Got a perm today. Shadow goes to groomer this afternoon. Are you seasick or did the pills do their job? Hi Grandma – We see your comments. And, yes, the pills / bands / ginger seem to be doing their job! Can’t wait to tell you all about it! Love you! Looking forward to the pix. Be safe! I’ve been reading all about your adventures. Really envy you two. Of course it’s not my favorite weather. It’s not exactly our type of weather either – give us Barbados anyday! But, we have to admit, between the parkas and the Bogs rubber boats, we have managed to stay surprisingly toasty! I agree. You know I don’t even like winter.